We're thrilled to have Andy Marino stop by to share more about his latest novel, AUTONOMOUS. Andy, what is your favorite thing about AUTONOMOUS? The interplay between the driverless car’s artificial intelligence and the human passengers. I wanted Otto—the car—to be a fleshed-out character in his own right, and the way his strange personality evolves changes the dynamic between the friends and frenemies on the road trip. It was important to me to find a new way to tell the “artificial intelligence learns about being human” story, and I thought it would be interesting—and funny—if this sophisticated prototype was learning from a group of teenagers making impulsive decisions and just generally being reckless. How long did you work on AUTONOMOUS? About two years, on and off—a burst of a few months for the first draft, another burst for the first round of editing, etc. Since books often take this long from draft to publication, I was a little worried about writing about an emerging technology. I definitely had some nightmares about the book being outpaced by the tech—like, what if self-driving cars are old news by the time it comes out? But the development has been slower than I think a lot of people anticipated. This is my fourth published novel, and I have just as many unpublished, plus enough fragments and false starts to wallpaper a mansion. For the first few years I was very anti-outline, and didn’t plan much in advance, so I followed a lot of rabbit holes to nowhere. Hence the pile of pages nobody will ever read! When I have a full day to write, which is rare, I head to the library and shoot for 2000 words. Otherwise, I work quietly at home. I can’t really do the coffee shop thing, or listen to music, because I am not a great multitasker and my brain can only focus on one thing at a time. Music—even instrumental music—and other people’s conversations are a surefire way for me to end up with a word count of zero. I’m jealous of authors who can listen to music while they work—I think it would be really cool to have a playlist that represents the emotional beats of the story as it unfolds. I just can’t do it. William Mackler is about to go on a road trip of a lifetime. After winning a contest—and nearly dying in the process—he becomes the proud owner of Autonomous, a driverless car that knows where you want to go before you do. #Worthit! To sweeten the deal he gets to pick three friends to go with him on a cross-country trip to see their favorite band. For William, a reckless adrenaline junkie, this is the perfect last hurrah before he and his friends go their separate ways after graduation. But Autonomous is more than just a car without a steering wheel. It's capable of downloading all of the passengers’ digital history—from the good, to the bad, to the humiliating. The information is customized into an itinerary that will expose a few well-kept secrets, but it will also force William to face some inner demons of his own. Think you know Autonomous? The real question is, how much does Autonomous know about you? 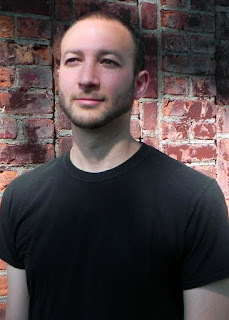 Andy Marino was born and raised in upstate New York. He spent his childhood orchestrating Lego pirate battles, drawing detailed maps of imaginary video games, and cheating death in Choose Your Own Adventure books. Profoundly influenced by the work of J.R.R. Tolkien and the movie Bloodsport, he started writing his first novel at the age of eleven. Tragically, THE RUNES OF ILLIARM was never completed. During his teen years, Andy designed sets for school plays and became an expert stockpiler of unfinished art projects. After graduating from NYU, he played guitar in the bands Sayonara and SleepCrime, and got serious about writing fiction. The insidious tractor beam of online social networks became the inspiration for UNISON SPARK, a novel about two teens with a secret past fighting the manipulative, all-consuming social network of the future. A morbid childhood fascination with Civil War photographs planted the seeds for UNCRASHABLE DAKOTA, which concerns the discovery of flight, a long-simmering family feud, and the fate of the world’s most magnificent airship – not to mention a very odd species of beetle. Years of living in New York helped create THE DOOR’s afterlife city, a never-ending metropolis of uncanny architecture and strange inhabitants. Have you had a chance to read AUTONOMOUS yet? Have you written about a technology you were worried would be outpaced by reality? Are you able to listen to music while you write? Share your thoughts about the interview in the comments! Congratulations to Andy on his having 4 books published. This one sounds like a spooky, brilliant read. It reminds me a little of HAL in 2001. Only worse! I would not like that car. I don't even like my smart phone. I relate to Andy's need for quiet focus when he writes. I can't listen to music either. It's too emotionally involving for me. I immediately start listening instead of writing. Me too. Sometimes I can write with music as long as there are no words, but usually I need silence for the people chatting in my brain.